Topeak has create its latest ALiEN series pocket toolkit the ALiEN III CB DX Pocket that has twenty-five high quality tools within a carbon fiber case to cover a broad range of road or trailside repairs. 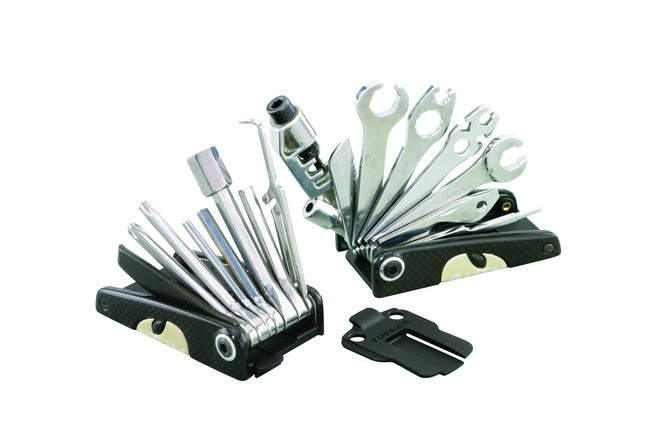 The main features of the pocket toolkit include 2-10mm hex wrenches, a cast chromoly chain tool, flat and Phillips screw drivers, a bottle opener, tire lever and a really sharp stainless steel knife. The chain tool is compatible with all single and multispeed bicycle chains, including hollow pin chains : Campagnolo, Shimano, SRAM.